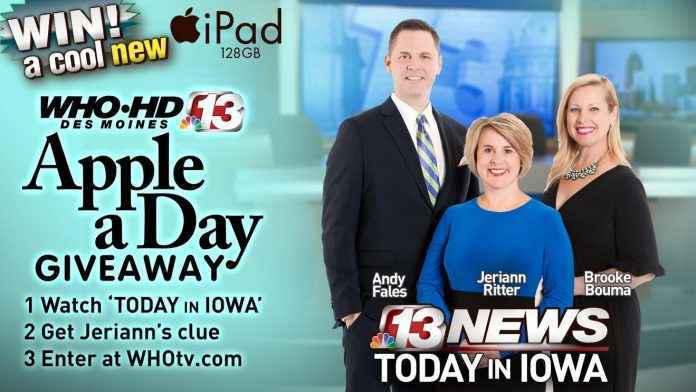 WHO TV brings you the Channel 13 Fall Apple A Day Giveaway Contest where they will be awarding a latest brand new 6th Generation Apple 9.7-inch iPad Wi-Fi tablet worth $409 to 20 lucky winners. How To Enter: Watch Today in Iowa on WHO-HD Channel 13 weekday mornings throughout the contest period from 5:00 AM CT to 7:00 AM to CT to get Clue Word, Once you have the secret code word now go to this link and follow the online instructions to register by entering all information requested on the registration form and once you filled out the entry form now including correct clueword. Prize: There will be 20 lucky winners in this Sweepstakes. Each lucky Winner will receive a 6th Generation Apple 9.7-inch iPad Wi-Fi tablet with 128GB of memory, Space Grey (Mfg#: MR7J2LL/A) The retail value of each prize is $409. Who Can Enter: Open only to legal residents of the United States and reside in the Ames/Des Moines Designated Market Area who have reached the age of 18 years old at the time of entry. When To Enter: The Sweepstakes entry begins on Thursday, January 31, 2019 at 5:00 AM CT and ends on Wednesday, February 27, 2019 at 9:00 PM CT.
Who’s Sponsor: The Who TV Apple A Day Giveaway Contest is sponsored by Channel 13 WHO-HD, 1801 Grand Ave, Des Moines, IA.